This is a bad week for sushi lovers who have been told we've probably been eating sushi wrong this whole time and now, that "healthy" option you just had for lunch may not be as good for you as you think. One of the best things about sushi—aside from its delicious nature—is that you never feel that food guilt over eating a whole platter to yourself. Because sushi is basically just fresh fish with a bit of rice and seaweed. What could be so bad about that? But it turns out that your sushi order may not even be that healthy, with some items packed with calorific ingredients. In fact, registered dietician Sarah-Jane Bedwell told SELF, "the per-roll calorie count can vary greatly from 140 to 500 calories." A roll isn't just one piece of sushi (thank god), but the whole roll that is made before it is portioned out—a roll can contain anything between two to 12 pieces, so it's had to pinpoint exact calorie counts without asking the restaurant you're in. To give you some idea, one salmon roll in Itsu (6 pieces) is 303 calories, which is a light lunch (if you just have one small box). The way things really escalate is when you're in a restaurant with limitless sushi possibilities and a bunch of friends who want to share a platter. That California roll may look like it holds about a teaspoon of rice but as nutritionist Amy Gorin told SELF, there is about 4 ounces of rice in each roll on average (approximately 147 calories). This means that if you go back for more sushi, you're likely already eating more rice than is recommended in a single serving. It is also usually white rice that is used in the rolls which doesn't have nearly as many nutrients as brown rice. Just one teaspoon of normal mayonnaise is approximately 31 calories so spruced-up rolls with spicy mayo goodness inside are going to be more calorific than a plain salmon and rice roll, for example. If you really want that creamy vibe in your food then Gorin suggests substituting mayo for avocado. It probably comes as no surprise that any rolls with fried contents are going to be higher up the calorie scale than non-tempura-based sushi. It's so tempting to douse your sushi in soy sauce at every given opportunity but to avoid consuming too much salt Gorin says you should soy your sushi as moderately as possible. Of course, sushi is yummy, and we're not saying to avoid eating it at all—but it's good to be clued up as to what's really going on inside those rolls. 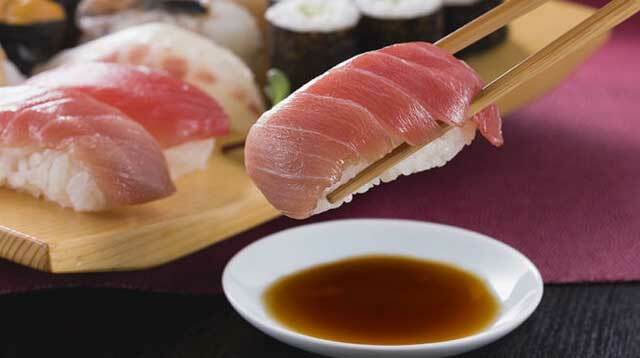 If you want a healthier option, try sashimi instead, it still has all that yummy fish without any of the rice.